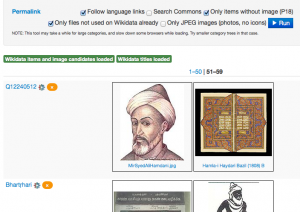 Wikidata has passed German Wikipedia in terms of articles/items with an image of the subject, and is now only second to English Wikipedia in that regard. As if in celebration, I added several new features to my Wikidata FIST tool, which makes adding images to Wikidata as easy as a single click (or two, if it’s a plaque, coat of arms, map etc.). 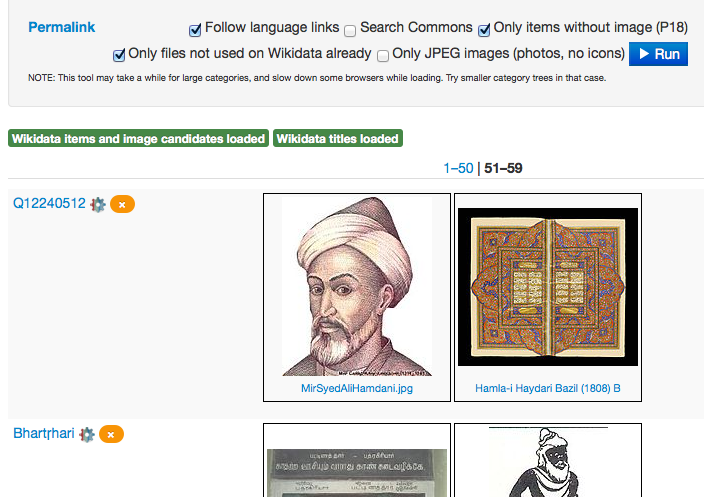 The first feature is to suppress image suggestions, if that image is already used in a Wikidata item. This cuts down on already associated “grave pictures”, as well as “symbol pictures” from infoboxes. The second is “JPEG only”, if you are looking for actual photographs, and not scans, maps etc. Third, each item with image candidates now has a little yellow button, which will prevent the images candidates from being shown again for this item. While there are several media properties for items, some things (painting by an artist, buildings by an architect etc.) will never be directly added to the item; instead, each painting/building should have its own item, and link to its creator. So if all image candidates are of that nature, spare yourself and others from having to go through them again next time. This was written by Magnus. Posted on Monday, June 8, 2015, at 09:29. Filed under Uncategorized. Bookmark the permalink. Follow comments here with the RSS feed. Both comments and trackbacks are currently closed.